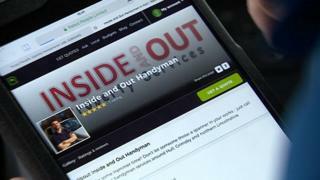 Fraudulent tradespeople can advertise their services on two trusted trade websites without any experience, a BBC Inside Out investigation has found. MyBuilder said it would review its processes, with Rated People calling its screening methods a "top priority". Users can filter results by their location and can also read reviews and ratings posted by the tradesperson's previous customers. Rated People did not ask for references, insurance or request any quality checks and MyBuilder's property maintenance questionnaire was passed by searching the internet for the correct answers. But many people turn to trustworthy trader websites thinking a large part of the homework has already been done - a belief for some that's proved to be an expensive mistake. Location, Location, Location presenter Phil Spencer, an ambassador for Rated People, said it was "shocking to hear that some bad tradesmen get through the net". David Ball, from Prescot, Merseyside, handed over £1,500 to a tradesman he found on the website to repair damp but he failed to treat the problem and is now "nowhere to be seen". "I thought they had a process in place to make sure the people doing the jobs were trustworthy," Mr Ball said. "You go through an external company because you think there's a level of protection there you're not getting if you're going direct." Rated People said tradespeople looking to sign up were screened with a credit agency, fraud prevention agencies and it "regularly reassesses all members". Accreditation is required to be validated "where official government accreditation is available", but "no formal qualifications or standards exist" for a handyman, a spokesperson added. The handyman evaluation is "the easiest to pass" as jobs in the category are "relatively low skilled and low risk", including assembling flat pack furniture or hanging pictures. Despite this, the company said it would still be "conducting a thorough review" of its handyman evaluation following the BBC investigation. You can see this story in full on BBC Inside Out Yorkshire and Lincolnshire, North West and East Midlands at 19:30 GMT on BBC One on Monday 29 January, or via iPlayer for 30 days afterwards.